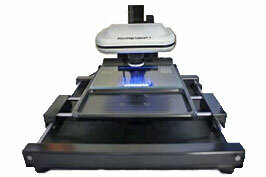 Low cost, microfilm scanner for use with a PC or a MAC! The EyeCom Micro-Image Capture 7 Microfilm Scanner incorporates the latest digital technology for high resolution viewing, printing and capture. The USB 2.0/3.0 interface allows fast, real-time viewing on XP, Vista & W7/8 platforms -both 32 & 64 bit and MAC systems. The Micro-Image Capture gives you a choice of capture options allowing for either full screen capture, select capture area by mouse drag, and multiple capture of selected areas on the same image that combine automatically on one page for print, save or e-mail output functions. The Image-Capture’s exclusive multiple output functionality allows for printing, save as image file, e-mail, & ftp outputs that can be configured to activate simultaneously! Output image format types include PDF, TIFF, JPG, PNG, PSD, BMP, CAL, GIF, CAL, WPG and more. Display images in black line, gray scale, color or black/white & invert at magnifications of 19-54X.